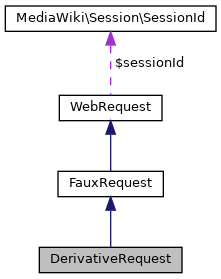 Similar to FauxRequest, but only fakes URL parameters and method (POST or GET) and use the base request for the remaining stuff (cookies, session and headers). Definition at line 34 of file DerivativeRequest.php. Definition at line 44 of file DerivativeRequest.php. References $base, WebRequest\$data, and FauxRequest\$wasPosted. Definition at line 73 of file DerivativeRequest.php. Definition at line 57 of file DerivativeRequest.php. Definition at line 49 of file DerivativeRequest.php. Definition at line 89 of file DerivativeRequest.php. Definition at line 53 of file DerivativeRequest.php. 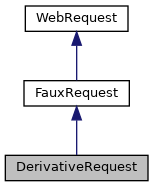 Definition at line 77 of file DerivativeRequest.php. Definition at line 85 of file DerivativeRequest.php. Definition at line 61 of file DerivativeRequest.php. Definition at line 65 of file DerivativeRequest.php. Definition at line 81 of file DerivativeRequest.php. Definition at line 69 of file DerivativeRequest.php. Definition at line 35 of file DerivativeRequest.php. Definition at line 36 of file DerivativeRequest.php.